It was another manic Monday morning. That was until 11.30am when we headed over to Turtle Bay on Oxford Street, in Central Manchester. We were there for the launch of their all new Kids menu. A fantastic selection of kid friendly cuisine, catered for all dietary requirements. After a mocktail class and a refreshing Nohito, we went on a pirate adventure care of the ‘Round The Twist’ motley crew. With our appetites fully ignited, we sat down to eat in the games area. A mezzanine floor just above the main dining area. The Tiny Turtles and Bigger Turtles mains range from £5.95 to £7.25. It was quite a shock to discover that each selection came with a starter and soft drink included in the price. We tried a large selection of dishes from the menu, but barely managed to order even half of what the menu had to offer. Food can be ordered all day and children are welcome to dine in the restaurant for the full opening period. As long as they are sat in the restaurant and accompanied by an adult. That’s right no throwing your food back before 9pm and having to dash. 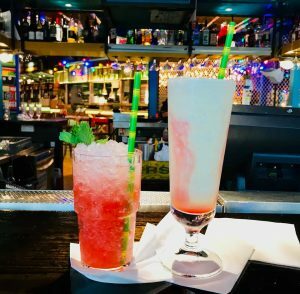 Turtle Bay is fully family friendly! 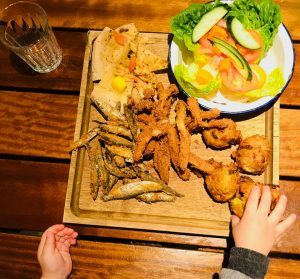 This half term if you fancy grabbing some munch, kids in tow, Turtle Bay are currently offering free kids meals with every paying adult. 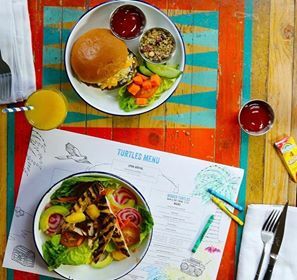 I absolutely adore Turtle Bay and I think it’s amazing that they are offering such a wide range of food on their kids’ menu as the food hasn’t always been brilliant for pickier eaters there. Ah really!? Because my kids are Little I’d never tried their kids menu before but after this I’ll definitely be bk, babes in tow!